Preheat oven to 350 F. Grease two 8″x8″ cake pans. In one bowl, mix together dry ingredients (salt, baking powder, flour). In another bowl, cream together sugar and butter until fluffy. Alternatively stir in dry flour mixture and milk until smooth. Pour half of the batter into each pan. Make sure to raise the cake batter up on each edge so that the cake rises evenly. Bake for 30-40 minutes or until inserted toothpick comes out clean. Using an electric mixer, beat together butter, milk and powdered sugar, one cup at a time. Mix in lemon extract and food coloring. Beat together whipping cream, sugar, and lime extract until fluffy. Mix corn syrup, water, and sugar in a medium saucepan. Stir constantly over medium heat until sugar dissolves. Stop stirring. Turn the heat to high, and using a candy thermometer, let the mixture boil until the liquid reaches 300-310 F. You can also determine whether it’s done by dropping some of the mixture into cold water and seeing if it turns into hard threads. Turn the heat off. Immediately stir in food coloring and lime extract until even. Pour onto the cookie sheet and store in freezer for fastest cooling. Allow lemon cake to cool. Cut the two cakes horizontally into four .75″ slabs. Divide each slab into four even strips. 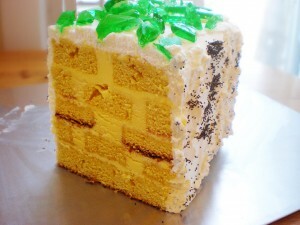 Beginning with the bottom layer, place two strips side by side and fill the gap with lemon icing. Additionally, spread icing over the entire top surface of the layer. For the next layer, divide one strip into two even strips, and place on top of the bottom layer, staggering to mimic brick layering. Fill in the gaps. Continue steps 3 and 4 until desired height has been reached. Ice the entire outside of the cake with the whipped lime icing. Break the lime candy into shards by dropping onto a hard surface. Sprinkle over top of cake. Shake some poppy seeds over the sides. Enjoy! Cake should be stored in refrigerator if not eaten immediately.